Whether you’re a professional photographer or not, most of us need a reliable photo editor that can do all of the work we need without subjecting us through various complicated procedures. PhotoScape is one of the many (many!) image editing software available for you to use. The good thing is that it’s incredibly easy to master. Plus, it provides a barrage of features and is absolutely free! Created by MOOII Tech, Korea, the program aims to become and one-stop-shop for all of your picture editing needs. It can easily crop, resize, enhance, print and even create GIF animation without much fuss. As of the moment, the program only works with Windows along with a default language of English and Korean. Luckily, this doesn’t rob it from its beauty. 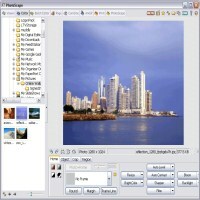 PhotoScape is one of those programs that you need to try out in order to appreciate. Unlike most image editing software, the program prides itself for having tons of useful features as well as a user-friendly interface. Beginners and advanced users will find it a nifty software to have at their disposal. From adjusting color curves, inputting presets or performing single-click auto adjustments, the program makes it easy for you to work. It provides various tools so you can easily manipulate or add effects to your photos. There are also tons of filters to make your pictures more interesting. In addition to that, it’s also possible to add shapes, text or even speech balloons to your photos if you’re looking for a whimsical touch. Batch processing within the program is also available so you can easily work with a bulk of pictures at one time; saving time and effort. Other neat features include a file renamer, screen capture, RAW converter and even a color picker! It definitely has everything you need. In fact, it’s even dubbed as one of the best free alternatives to Photoshop. Give it a try. BumpTop – transform your desktop into a real 3D workspace!